Can You Lose Weight by Doing Bikram Yoga? People passionate about Bikram yoga tell you it's all you need to get fit -- it offers cardio, flexibility and strength with a tremendous calorie-burning potential. With those benefits, this version of yoga, which is based on 26 specifically ordered postures practiced in a room with a temperature of 105 Fahrenheit with 40 percent humidity, should surely lead to weight loss. While yoga has benefits that do include increased mindfulness and stress reduction that can lead to weight loss, Bikram yoga is no different from any other practice in offering these benefits. If Bikram yoga appeals to you, makes you more active and helps you feel health benefits -- go for it. But, don't expect it to magically melt away pounds. When researchers measured the caloric burn during class, they found it equal to what you burn during a brisk walk -- approximately 410 calories for the average man and 330 calories for the average woman -- in the 90 minutes of a traditional class. A 155-pound person who spends less time -- about an hour -- on an elliptical machine at a moderate pace burns 700 calories on average. Run for an hour at a modest 5 mph and burn almost 600 calories. Weight loss is a matter of burning more calories than you consume, and it takes a 3,500-calorie deficit to lose just one pound, so while you can technically lose weight doing Bikram yoga, you'd lose weight faster doing other activities. The Colorado State University Researchers expressed surprise that the calorie burn was so mild, but they surmised that the heat in Bikram yoga creates the perception that the class is harder than it actually is. A separate study conducted by the American Council on Exercise in 2013 found that people worked at an average of 57 percent of their maximal heart rate in a typical heated yoga class, and 56 percent of their maximal heart rate in a typical non-heated yoga class -- classifying hot yoga as "light" exercise in the fitness industry guidelines. Note that the ACE study looked at classes conducted in about 95 degrees, not in the ten-degree-higher heat environment of Bikram, however. Despite the lack of physiological indication of greater work, participants in the ACE study still rated the class as harder -- researchers assume, again, because of the heat. Although Bikram yoga doesn't burn enough calories to lead to substantial weight loss, it may have other effects that could influence the way you approach food and stress. Yoga doesn't cause weight loss, but it could spur you to change your behavior, which then helps you slim down. Yoga, including Bikram, helps you tune into your body more effectively. This awareness happens in class, of course, but could also transfer to the dinner table; you might notice sensations of fullness more readily, or notice that a food doesn't sit well with you and choose to abstain. A study in an August 2009 issue of the Journal of the American Dietetic Association determined that regular yoga practitioners gained less weight over a 10-year period than those who did not practice yoga. The type of yoga didn't matter. Yoga can't be directly credited with this weight management, but those with less weight gain reported practicing habits related to mindful eating possibly learned through yoga. A class that's more soothing than Bikram may have impacts on weight loss, too. 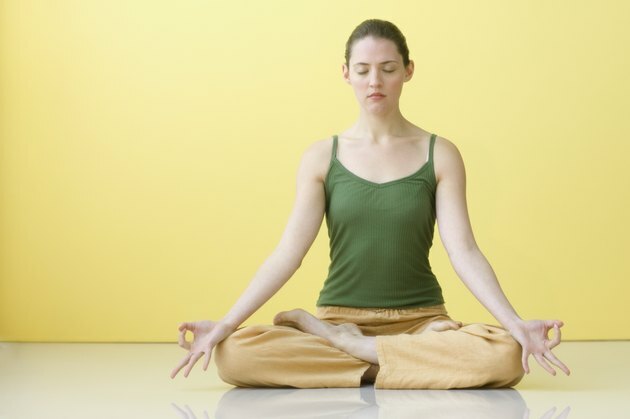 A study published in the journal Metabolic Syndrome and Related Disorders in 2008 found that a restorative practice, which involves lots of seated and prop-supported poses that are held quietly for minutes at a time, made a marked difference in blood pressure, energy levels and stress in participants suffering from metabolic syndrome. This reduction in stress on the body and in the mind might help a person be more active during the day, pump out less of the stress hormone cortisol, which encourages weight gain, and simply have a better attitude toward adopting healthy living habits. The high temperature of Bikram yoga may be unsafe for people with heart conditions and other health issues or those who take certain medications. It's also unsafe for pregnant women. If you're unsure if it's right for you, ask your doctor before stepping foot in a studio. Bikram yoga's heat can also induce temporary symptoms of discomfort, such as dizziness, nausea and muscle cramping. Dehydration is a very real possibility, too. You will sweat a lot in Bikram, which means you're losing valuable electrolytes including sodium and potassium along with fluid. Rehydrate with a sports drink that contains these minerals if you feel weak or light-headed after class. If you weigh yourself just after class, you may notice a drop on the scale. This is most likely due to the fluids you sweated out during the practice, though, and not a reflection of true fat loss. Time: Is Hot Yoga Good for You -- and Weight Loss?